(Newser) – Almost 2,000 years ago, a child sheltered in Pompeii's central bath house complex as nearby Mount Vesuvius erupted terrifyingly, spewing vast amount of hot ash and pumice. The child's body was undisturbed until this year, when archaeologists using ground-scanning tools were surprised to find it just inches below the surface at an entryway to the bath house, the Local reports. 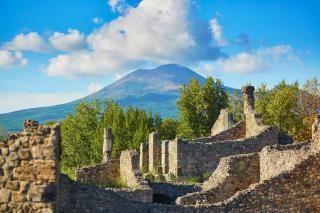 The body of the child, believed to have been seven or eight years old, is the first to be found at Pompeii in decades. Researchers believe he or she, like thousands of others who failed to flee the Roman city near present-day Naples, was suffocated by clouds of ash, which later hardened around the body, reports the Telegraph. Kids in the bath house? Perverts. This's the era man and woman innocent was preserved and upheld, unspoiled, everybody to everybody respected each other, women were equal like men and no disparity whatsoever. This unspoiled very well civilized and cultured world was taken by the most brutal uncivilized uncultured medieval middle eastern desert donkey rode tribal primitive nomadic illiterate ragtag god biz aka Jesus biz(an Ethiopian slave brought to Egypt by Egyptians to do their gigantic projects and escaped to Judea and those people called them Jews - if he ever existed as there are no carbon dating prove any damn thing unlike Egyptians), today's version of Brian(Monty Python). When one wade through these well preserved ruins and reading their epitaphs and arts - what a free life men and women enjoyed with so much of happiness with no one to say - you're going to hell, burn in hell vulgar etc and no god biz to burn them alive or burn at stakes, no one to call women as witches - isn't it. And no racism either, as black African coming as slaves but once they get their full Roman citizenship - sky was the limit to live as free man! Oh my, when I read the headline and saw extraordinary find and bath house, for a second though, I thought they found a President Obama look alike on a wall made in chalk. Chucks! !